Thank you. The truth is that this is very strange. It's strange, let's face it, accept it, recognize it, it's strange. Very strange, but the situation we are living is so weird, and extraordinary and since we're living in an extraordinary situation, we must do extraordinary things, strange things. What we want is to do normal things, normal things that would mean that we are in a normal situation, because that would mean we are in a normal country. But since we don't have that, we have to do things that are so clearly not normal in this context that we would want, and since that's what we want, it's what we have to build. That's what this is about. That's what all these people are about, all the present company, this completely diverse group of people, so varied, that represents not only the range of sovereigntism and an ample notion of sensibilities, of personal paths, but also within the social panorama, within the ideological gamut. And no one has to give up one gram, not one gram of their own identity. That's what this is about. About normalizing diversity and having just that serve a common, shared objective that must definitively serve to make normal that which in other situations, in other states, they find commonplace. This accord is an agreement that attempts to clearly, directly, and exceptionally express what has been a widespread, shared demand of millions of the citizens of Catalonia. That which brought us to November 9th last year to vote, to disobey, to face even state institutions that do not understand very basic concepts like the most basic and fundamental tenets of democracy. That they have behaved this way—faced with political and democratic demands—with a response in the criminal courts, through the legal system, is inconceivable, and not only that, directly affects three actual, real people as well as all of the people who also exercised their democratic right. And they evidently weren't finished there. That's why September 27th is a new opportunity to do that which we couldn't do properly on November 9th. The possibility of exercising our right to vote. To express what we want to do, how many of us there are who want to do this, and obviously, if there is a majority. And this is the most important part: to do it. It's not just "wanting to do it". Now it's about saying "We want to offer a mandate, we want to give a mandate to those who have the power to exercise this mandate, so that they carry it to fruition." And that for me is the fundamental essence of this agreement. It's a time-sensitive agreement with a very specific objective. It's an agreement that aims to convert the September 27 Parliamentary elections into a plebiscite. Some people don't like that term, and that's legitimate, but we want to establish the plebiscitary character of these elections, among other reasons because we haven't been able to do so another way. We have tried everything before reaching this point. We have tried everything. In negotiations, of all kinds, and in every language possible. And we have gotten nowhere, absolutely nowhere, at least where we hoped to get to and thus now we find ourselves in this situation in which we need to do something special on September 27, something extraordinary, something that we understand will be surely surprising in some sectors, and even disconcerting. We are in agreement. But it is precisely this exceptional caracter that gives extraordinary value to this agreement and this joint proposal—which is not a list of people, we have said that many times—it is a list of wills, of wishes, it is a representation of a collective feeling that beyond the names of the people and beyond the order of the candidacy list, represents an enormously diverse sensibility. And in effect, we obviously would have liked other people to have joined us, but at any rate, it's not an issue that they're not there just now. What we are doing is keeping the door quite open so that at any moment in the process, as they wish, as they consider, they can come in, and we can make this space broader and as open as possible. That's what it's all about. What we are presenting today, in addition, is a plan and in this respect I would like to be careful not to make any mistakes about the order because it is obviously very important to take the steps that need to be taken expeditiously and properly. Things must be taken care of well and quickly. The other day Doctor Viver Pi-Sunyer made a specific reference to this order of matters. They must be completed properly and they must be taken care of quickly. Both things are important. If on September 27 this proposal that we are presenting gets a sufficient, necessary majority, what we want is for the Parliament of Catalonia to solemnly declare that in virtue of this mandate given by the citizenry of Catalonia that the process of independence be initiated. [Applause] It could probably be said louder, but I'm not sure it could be said more clearly. Obviously this will initiate a process, I repeat, not of 'wanting' but of 'doing'. Then work will begin that I find especially important, the first phase which will be giving a mandate to the government so that it moves forward with the design of the state structures that we will need in order to do what we want to do. Therefore, we will need, obviously, to give ourselves those tools that will be needed in order to, at the given moment, complete the disconnection with the Spanish legal system. From here, a third aspect begins which is fundamental, that is, the process of writing a new constitution, a constitution, The Constitution, and which of course requires citizen participation. It is essential to understand that this process will go from bottom to top, that here there is clearly a process of mobilization, promoted by everyone and by all of those actors and organizations who want it and who desire to do so, to construct this framework, this body of jurisprudence, this magna carta which must be the legal foundation on which the future country, the future state rests. Once we have that done, we will begin to set in motion the tools that we have at our disposal to be able to build these state structures, or to apply these state structures, without forgetting—and this is the aspect that I want to be sure to underscore—the immediate, daily, urgent social needs that at this moment we have all around us and are the fundamental reason for which we are doing and want to do all that we are doing. And when we have all that done, we will proclaim our independence, and this will basically be the beginning of a process of disconnection with respect to the Spanish legal system. 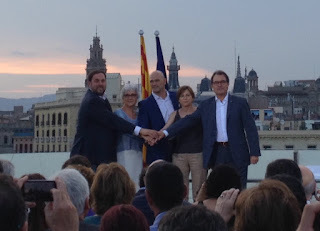 This disconnection will imply approving a law of transitory jurisprudence, and this law will require that we adapt all of the legal framework both with respect to the Catalan and to the Spanish systems, as well as the European one, obviously, and in effect also in the international framework necessary to provide us with our own legal system. While we are very aware of the risks involved in all of this, we are above all aware of the enormous opportunities. For me this is fundamental because we must be conscious of, as we have seen these past few yars, that they will not make it easy for us. Not at all. If they had wanted to make it easy for us, we probably wouldn't have gotten to where we have gotten. 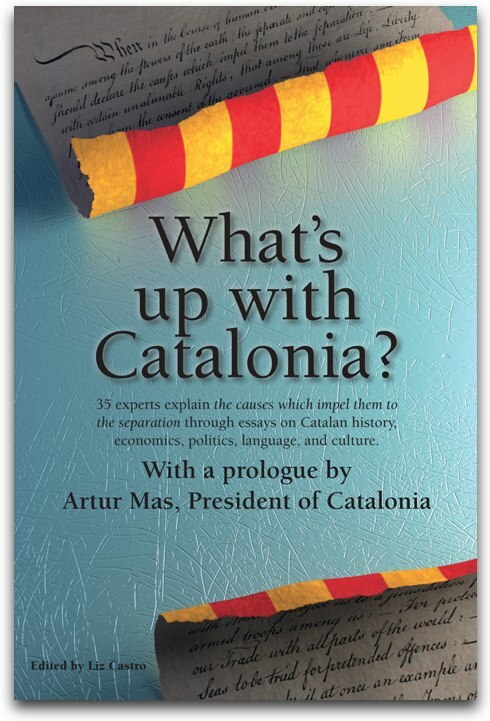 But they don't make it easy, and thus we know that if during this process, the Spanish State, through political or legal decisions, blocks Catalonia's self-government, the Executive, or the Parliament of Catalonia, we will continue on with the proclamation of independence and the approval of a law of transitory jurisprudence. We are going all out. We are going all out. We have no wiggle room, and this aspect, it is this aspect that is fundamental to me. Everyone must understand that this is for real. Everyone must understand that we are prepared to do this well, but above all that we are prepared to do this. That is the most important thing. Allow me in the framework of diversity to refer also to the people of Aran: [in Aranese] Now the people who are in conformity with this agreement have joined us in the will to build a country that is better united among us. The will of all of the people that form this candidacy, this list, this proposal, this ballot, that definitively is what will convert uncertainties into certainties, risks into opportunities and will provide us with the tools that above all will make real the grand hopes of living better, of living in a better country, of living in a country that is more just, to live in a country that is more united, to live in a country clearly—it must be said—more generous, more open, more participatory, with a clear will of building not just the country itself, but also the environment in which we are immersed, be that on the level of the peninsula, or Europe, or the world. But to do that, it's necessary to know where our weaknesses are, and above all where are fragilities lie, and to detect and have very clear which are the areas, and also which groups of people are in the most difficult situations. And not only must we keep them in mind, we have to keep them in the forefront of all that we want to construct. If not, this wouldn't make any sense. There wouldn't be any point. For that reason, we are saying at an institutional level, at a legal level that this needs to be accompanied by a list of measures, that from a social perspective have as a priority fulfilling the basic needs that many, many people have. And it's important just to make that clear, even if I don't detail them, but I think it's important to declare them so that nobody misses—I repeat—the reasons behind all this. The point of it all. First, we need to attend to urgent needs in terms of housing, energy poverty, and second chances for vulnerable and poor families. A policy of providing nursery school placement managed by public and public-private institutions. Tending to the needs of protection against infant poverty and especially guaranteeing adequate nutrition. The reform of the minimum wage toward a guaranteed citizens' wage. The creation of new state structures for the well-being of the people in order to expand and guarantee the future of pensions. We know that many people are notably worried about this point. We want to assure them. We want to give them guarantees so that no one has to worry about this point. A push for education, encouraging research and innovation, support for the social economy, building on the potential and improving public works jobs, and the generation of a new model of labor relations based on social dialogue, co-participation, and an effort that favors gender equality, creation of decent jobs, and quality businesses. Towards a new minimum wage, a European minimum wage, in accordance with European standards. To empower youth guarantee policies, to strengthen the public system of health and social services. An inclusive Catalan educational model to ensure scholastic excellence. A welcoming country that is socially advanced and capable of guaranteeing an open society, with inclusive legal frameworks that are open to everyone. For everyone means for each and every person, without exception. And finally, a country that is culturally advanced, and in which we hope to convert culture into the fourth pillar of our well being. It's not a small thing. That's the impetus, the fundamental reasons that motivate us to present this candidacy that we would like to call "Together for Yes". "Together for Yes" means a project that joins very diverse sensibilities with a common objective out of a broad based diverse group of people that form this proposal. "Together for Yes" is a variety of different Catalan political offerings born of a combination of people who come from various political entities and organizations, or political parties, and others that come from civic and community groups and others who come on their own, thanks to their strengths and for their renown and for the diversity that we are constructing. With the desire to build a candidacy that can allow us to achieve the best electoral result and that allows us to, let me say again, achieve the citizen mandate provided by the plebiscitary character of the September 27 elections. And that, clearly, will have repercussions in the joint, specific, concrete work done in the framework of the Parliament and within the Government. Work that must serve to prioritize, I repeat, these needs that we have in social services. But above all to also give us this legal framework that must allow us to complete this separation and convert us, sooner rather than later, in this state that we not only want but that we need in order to be able to do many of the things that until now we have not been able to do precisely due to this lack of institutions, this lack of tools, this lack of infrastructure. And the same thing will happen in the area of government. A government that will have a temporary mandate, a specific mandate, a mandate that we hope will be short in duration as that will mean that we have gotten to our objective as quickly as we could. And when that is all done, it will be time to hold elections, and these yes will be constituent elections, and then, may the best candidacy win. Thank you. Bé, moltes gràcies eh… la veritat és que això es molt estrany. És estrany, diguem-nos-ho, eh.. acceptem-ho, reconeguem-ho, és estrany. És molt estrany, però és que la situació que estem vivint és absolutament estranya, és extraordinària, i com que estem vivint una situació extraordinària, s’han de fer coses extraordinàries, estranyes. El que nosaltres voldríem, és poder fer coses normals, coses normals perquè voldria dir que estem en una situació normal, perquè voldria dir que estaríem en un país normal. Eh, però com que no el tenim, hem de fer coses que no són clarament normals com les podríem entendre en aquesta situació que voldríem i que per tant com que la voldríem és precisament el que volem construir. D’això va la cosa. D’això va això, d’això va aquestes cares aquestes eh, companyies, d’això va òbviament aquests acompanyaments, aquesta presència tant diversa, tant plural, que representa, no només dins de l’arc del sobiranisme una eh, opció molt diversa de sensibilitats, de trajectòries personals fins i tot, però també dins de l’arc social, dins de l’arc ideològic, eh i ningú ha de renunciar ni un gram, ni un gram a la seva identitat. D’això va la cosa. De normalitzar la diversitat i de posar-la precisament al servei d’un objectiu comú, compartit, que en definitiva ha de servir per poder fer normal allò que en altres àmbits, en altres estats troben normal. Aquest acord és un acord, eh que pretén d’una manera clara, d’una manera directe, d’una manera excepcional, eh, acompanyar el que durant molts anys ha estat sent la demanda la petició de la ciutadania de Catalunya de manera massiva, de manera multitudinària, de manera milionària, en termes de xifres. Allò que ens va portar al 9N a votar a desobeir, a enfrontar-nos fins i tot a unes estructures d’estat que no entenen conceptes molt bàsics com són els de la democràcia més bàsica i més fonamental. Que ha comportat que hi hagués, davant d’una demanda política i democràtica una resposta per la via penal, per la via jurídica, cosa que és inconcebible i que a més a més recau en tres persones amb noms i cognoms però que els hi recau precisament en nom de totes les persones que també vam exercir aquest dret democràtic. I amb allò no en van tenir prou evidentment. Per això el 27 de Setembre és la nova oportunitat de poder fer allò que estrictament no vam poder fer el 9 de Novembre. La possibilitat de poder exercir el nostre dret a vot. A expressar què volem fer, quants i quantes som els qui volem fer això, i òbviament, si hi ha majoria, i aquesta és la part la més important, fer-ho. Ja no es tracta només de dir ‘volem fer-ho’. Ara es tracta de dir ‘volem oferir un mandat, volem concedir un mandat a qui te la potestat per poder dur a terme aquest mandat, perquè l’exerceixi. I aquesta és per mi, l’essència fonamental d’aquest acord. És un acord puntual, és un acord que té un objectiu molt específic. És un acord que té com a repte convertir el 27S en unes eleccions plebiscitàries. Hi ha qui no li agrada aquest terme, i és legítim, però nosaltres volem establir el caràcter plebiscitari d’aquestes eleccions, entre altres raons perquè no hem pogut fer-ho d’una altre manera. S’ha provat tot fins arribar fins aquí. Ho hem intentat tot. En diàleg, de totes les maneres i en tots els idiomes possibles. I no hem arribat enlloc, pràcticament enlloc, o al menys allà on volíem arribar, i per això ens trobem en aquest escenari que és el 27 de Setembre amb la necessitat de poder fer una cosa estranya, una cosa excepcional, una cosa que entenem que és, segurament, sorprenent en molts àmbits, i que, eh, desconcerta. Estem d’acord. Però és precisament aquest caràcter excepcional que li dona per mi un valor extraordinari a aquest acord i sobretot a aquesta proposta conjunta, que no és una llista de persones, ho hem dit moltes vegades, és una llista de voluntats, és una representació d’un sentiment col·lectiu que més enllà dels noms de les persones i més enllà de l’ordre de la candidatura, representa una sensibilitat enormement diversa. I efectivament, òbviament hauríem volgut que molta altre gent s’hi hagués incorporat, d’acord, en tot cas no passa res que no hi siguin en aquests moments. El que sí que mantenim és la porta extraordinàriament oberta perquè en algun moment del procés, com vulguin, com considerin, la puguin creuar, i puguem fer aquest espai el més ampli, el més, eh, obert possible. D’això va la cosa. El que presentem avui, a més a més, és un, eh, pla, i en aquí sí que m’agradaria no cometre cap error d’ordre perquè òbviament és especialment important, eh, fer les passes que s’han de fer de manera correcte i de manera ràpida. Les coses s’han de fer bé i ràpid. L’altre dia el Doctor Pi-Sunyer, Viver Pi-Sunyer en feia la referència específica en aquest ordre dels termes. S’han de fer bé i s’han de fer ràpid, però les dues coses són importants. Eh, si el dia 27 aquesta proposta que posem a escrutini te la majoria suficient i necessària, el que nosaltres volem és que el Parlament de Catalunya declari solemnement que en virtut d’aquest mandat que la ciutadania de Catalunya li haurà concedit, s’iniciï el procés d’independència. [Aplaudiment] Segurament es pot dir més alt, segurament. No cal perquè tenim… Es pot dir més alt, però crec que no es pot dir més clar. Eh, òbviament això iniciarà un procés, repeteixo, no ja de voler fer sinó de fer. Començarà el treball per mi especialment important, de eh, la primera fase que serà concedir el mandat al govern que surti per posar en tot cas en marxa el disseny de les estructures de l’estat que necessitarem per poder fer això que volem fer. Per tant necessitarem, òbviament, dotar-nos d’aquelles eines que hauran de servir per, quan sigui el moment, poder fer la desconnexió efectiva de l’àmbit jurídic espanyol. A partir d’aquí comença també un tercer aspecte que és fonamental, que és el procés d’elaboració d’una nova constitució, d’una constitució, de La Constitució, amb la primera de les dues fases que s’han de dur a terme que és òbviament la participació ciutadana. Fonamental entendre que aquest procés anirà d’abaix a dalt, que aquí hi haurà un procés de òbviament dinamització, impulsada per tothom i per tots aquells actors i per aquelles entitats que ho vulguin i ho desitgin, per construir aquest marc, aquest corpus, aquest- aquesta carta magna que ha de servir de, eh, essència fonamental legal pel que ha de ser el futur país, el futur estat. Una vegada tinguem això començarem a posar en marxa les eines que tinguem a disposició per poder construir, òbviament, eh, aquestes estructures d’estat, o aplicar aquestes estructures d’estat, sense oblidar, i això es un aspecte que no vull deixar de remarcar, les necessitats socials immediates, diàries, urgents, que en aquests moments tenim al nostre entorn i que són la raó fonamental per la qual fem i volem fer tot això que estem fent. I quan tinguem tot això fet, proclamarem la independència, i això vol dir bàsicament- això suposarà bàsicament començar amb el procés de desconnexió respecte l’ordenament jurídic espanyol. Eh, aquesta desconnexió implicarà aprovar una llei de transitorietat, i òbviament aquesta llei requerirà adaptar tot el marc jurídic tant a l’àmbit autonòmic català com en l’àmbit estatal, com òbviament també en l’àmbit europeu, i efectivament també en, eh, l’ordre internacional que convingui per poder dotar-nos d’un àmbit jurídic propi. Som molt conscients dels riscos que tot això té. Som però sobretot conscients de les enormes oportunitats que tot això té. I per mi això és fonamental perquè, eh, hem de ser molt conscients de que, com hem vist en tots aquests anys, no ens ho posaran gens fàcil. Gens. Si ens ho haguessin volgut posar fàcil segurament no hauríem arribat fins on arribat. Però no ens ho posaran gens fàcil, i per tant sabem que si, eh, en aquest procés, eh, l’estat espanyol, mitjançant decisions polítiques o jurídiques bloqueja l’autogovern de Catalunya, el Govern, o el Parlament de Catalunya, procedirem igualment a la proclamació d’independència i a l’aprovació de la llei de transitorietat jurídica. Anem a totes. Anem a totes. Ja no tenim marge, i aquest aspecte, aquest aspecte per mi és fonamental. Cal que tothom entengui que això va de debò. Cal que tothom entengui que estem disposats a fer-ho bé, però sobretot que estem disposats a fer-ho. És el més important. Permeteu-me en el marc de la diversitat referir-me també a la gent de l’Aran: Ara gent que conformà amb aquest acord mos unís era voluntat de vestir un país més just e més cohesionat entre tutti. La voluntat de tota la gent que conformem aquesta candidatura, o aquesta llista, o aquesta proposta, o aquesta papereta, que en definitiva és el que és, és eh, convertir les incerteses en certeses, els riscos en oportunitats, i dotar-nos d’aquelles eines sobretot per fer efectives les grans esperances de viure millor, de viure en un país millor, de viure en un país més just, de viure en un país més cohesionat, i de viure en un país òbviament, també ho hem de dir, més solidari, més obert, i més participatiu, i amb una clara vocació de construir no només el país en si, sinó també l’entorn en el qual nosaltres ens trobem immersos. Sigui a nivell de La Península, sigui a nivell d’Europa, sigui a nivell del mon. Però per això és prioritari saber on tenim les febleses, i sobretot tenim les fragilitats, i sobretot detectar i tenir molt clar quins són els sectors, també aquests grups de persones que tenen una situació vital més dura. I no només se’ls ha de tenir en comte, se’ls ha de posar al davant de tot això que volem construir. Si no, no tindria sentit. Si no, no tindria sentit. Per això tot això que estem dient a nivell institucional, a nivell jurídic va acompanyat de una, eh, carpeta de mesures, o d’una llista de mesures, eh, que des de l’àmbit social tenen com a prioritat donar resposta a les necessitats bàsiques que avui tenen moltes i moltes persones. I a títol estrictament anunciatori, que no les detallaré, però que simplement crec que és important posar-les de manifest perquè ningú se li escapi, repeteixo, el per què de tot això. El per què de tot això. Primera, atenció a les necessitats urgents en matèria d’habitatge, de pobresa energètica, i de segones oportunitats per les famílies vulnerable- vulnerables i en situació de pobresa. Una política de provisió de places d’escola bressol gestionades per institucions públiques i de concertació a breus públics. Atendre les necessitats de protecció contra la pobresa infantil, i especialment garantir òbviament l’alimentació. La reforma de la renda mínima d’inserció cap a un model de renda garantida de ciutadania. La creació de noves estructures d’estat del benestar per ampliar i garantir el futur de les pensions. Sabem que molta gent aquest aspecte li preocupa de manera notable. Volem seguritzar. Volem, eh, donar garanties de que per aquesta via ningú ha de patir. Una escola catalana i inclusiva i per l’èxit escolar. Un país acollidor, socialment avançat, capaç de garantir una societat oberta, i amb uns marcs legals integradors, i inclusius per a tothom. Per a tothom vol dir per a tothom, sense exclusions. I finalment un país culturalment avançat, que aspirem a convertir, des del punt de vista de la cultura, com la quarta pota de l’estat del benestar. No és poca cosa. Això és el per què, les raons fonamentals que ens porten a presentar una candidatura que ens agradarà anomenar “Junts pel Sí”. Junts pel Sí vol dir un projecte que reuneix sensibilitats molt diverses amb un objectiu comú a partir de la transversalitat i a partir de la diversitat de la gent que conformem aquesta proposta. “Junts pel Sí” vol dir que les diferents circumscripcions catalanes tindrem una combinació de gent que forma part d’entitats polítiques o d’associacions polítiques, o de partits polítics, i altres que formen part d’associacions eh, cíviques o d’organitzacions, eh, civils, i d’altres que hi participaran a títol, eh, personal per les seves capacitats o pel seu, eh, àmbit de referència a nivell, repeteixo, d’aquesta diversitat que estem construint. Amb la voluntat de construir una candidatura que permeti arribar al màxim, eh, resultat i millor resultat electoral, i que permeti repeteixo, dotar-nos d’aquest mandat ciutadà que ens ha d’ajudar de caràcter plebiscitari el 27 de setembre. I això, òbviament, repercutirà també en una feina conjunta, puntual, concreta, en el marc del Parlament i en el marc del Govern. Una feina que ha de servir per prioritzar repeteixo, aquestes necessitats que tenim a l’àmbit social. Però sobretot també per dotar-nos d’aquest marc jurídic que ens ha de permetre fer aquesta desconnexió i convertir-nos, més tard que d’hora en aquest estat que no només volem, que necessitem per poder fer moltes de les coses que fins ara no hem pogut fer precisament per aquesta manca d’institucions, per aquesta manca d’eines, per aquesta manca d’estructures. I el mateix passarà el l’àmbit del govern. Un govern que té un mandat temporal, un mandat específic, un mandat que esperem que sigui curt des del punt de vista del que això voldrà dir que haurem arribat com més aviat millor a aquest objectiu. I quan tot això estigui fet, tocarà tornar a convocar eleccions, aquest com sí, eleccions constituents, i en aquest marc que guanyi el millor. Moltes gràcies.